SILVER SPRING, Md. 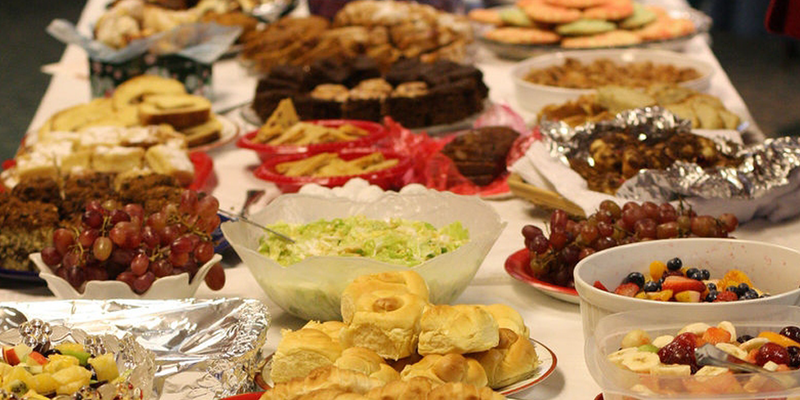 --- In a rare potluck-related church policy statement, the General Conference has issued strict orders to Seventh-day Adventist churches worldwide regarding their potluck dish selections. Pastors and senior potluck coordinators the world over have been instructed that potlucks must feature exactly 28 different dishes. "Don't think that just because we happen to be the Seventh-day Adventist Church you can get away with featuring just seven different dishes,' said GC Director of Potluck Affairs, Tony Glut. "Our love affair with the number seven in no way gives us the right to fall short of our high standards for potluck dish variation." Glut added that church leaders had no objection to there being seven different varieties of Special K Loaf available at any given church potluck but that this impressive achievement in no way gave local congregations permission to "phone in big picture potluck responsibilities." He added a special note of caution to "lax congregations" that might be tempted to think that creating a haystack bar with 28 different toppings in some way fulfills the 28-dish GC potluck requirement. "Don't even think about cutting corners like that," said Tony. Isn’t the GC requirement to have 28 dishes at a pot luck an enticement to gluttony, the Third of the Seven Deadly Sins? Maybe we need to ask Tony Glut to elaborate on that. If this post may be a parody on treating all 28 beliefs as “fundamental,” AToday has an opinion piece suggesting that a shorter, more succinct list would be better. Coincidentally, I myself have previously suggested that our beliefs could be reduced to seven core concepts. 1. Accept Jesus Christ as Savior. 2. Love God with all your heart. CLICK ON ELIZABETH’S NAME FOR A REALLY GOOD READING ON JEWELRY AND THE BIBLE. Years ago, Howard Johnson restaurants used to produce 28 flavors of ice cream. They were ahead of the curve. Maybe we should consider 144,000 ways to concoct a potluck. Come to think about, I’ve eaten at least 144,000 pot lucks since I became an SDA!! I can’t wait to eat at the mile long table up in Heaven!! Woe is me!! The overriding principle is that if it tastes good it won’t be allowed under any count. That’s a bummer, ’cause I was gonna say “The more the better;” I don’t care how many dishes there are as long as I can feed my face. Don’t tell me the SDA Papacy is at it again. There’s is too much heavy-handed, bureaucratic commanding of conferences and local congregations. This was supposed to be a “bottom-up” church organization where the power flows upward to the top, rather than down from the top. The cart has taken its place firmly before the horse. Didn’t E. White say you should eat only 4 or 5 kinds of foods at the same meal, and don’t mix fruits with veggies? Looks like the SDA Papacy forgot about that. And what about Little Debbies? No potluck would be complete without the trifecta of SDA cuisine: Special-K Loaf, Haystacks, and Little Debbies! Hint: they are even more delicious when consumed to the background music of Del Delker and the Heritage Singers. I don’t know why everybody laughs at these stories if they are not funny. This site is perpetuating comical lies in the name of “satire.” Satire is one thing; lies are another. This story is neither one! You can stop hiding behind that silly screen name (“sevvy”). We know who you are; our private eye has identified you as Carlos Zemeta-Oregano of Tiahuanaco, Bolivia. You are a great writer. Why not use your time and talent to write something true and worthwhile, like The Adventures of Captain Underpants or Catcher in the Rye? Nobody (not even me) even reads this site anymore; and all the readers who write comments are a big bunch of losers (including me). What is the world coming to? A nickel ain’t worth a dime anymore! It should be pointed out that the fundamentalist Adventists demanded that the permitted toppings be limited to seven (7), the perfect number. The more liberal SDAs asked that they be increased to seventy-seven (77) toppings based upon the teaching of Matthews 18:21 & 22. It is expected that the compromise of 29 toppings will not calm the stormy waters and it may need to be resolved at the next General Conference in 2020.